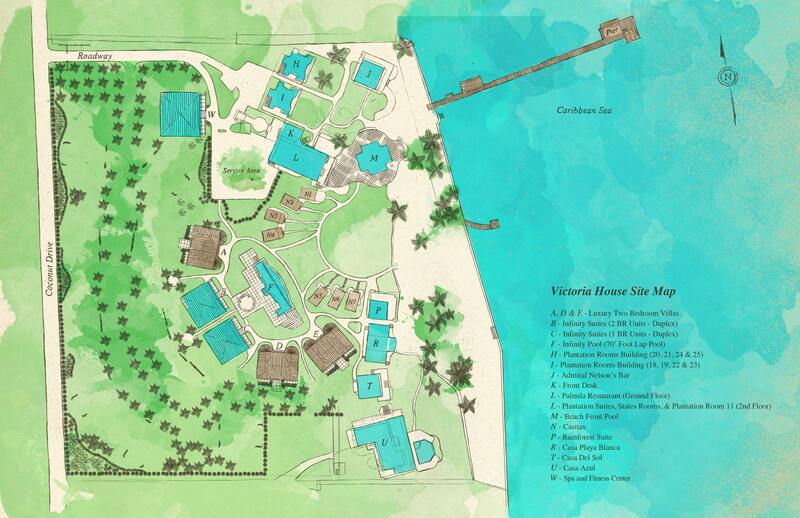 Victoria House is a beautiful Belize beach resort on the east side of Ambergris Caye, facing Coconut Drive, the tranquil road that takes you into nearby San Pedro. Please feel free to view our site map in order to get a feeling for our unique layout and spacious grounds. As you can see, a lush tropical buffer lays between the roadway and our special blend of luxury staterooms, villas, plantation rooms, and casitas, all facing the Caribbean Sea. You can also see the near beachfront location of our famous Admiral Nelson’s Bar and the acclaimed Palmilla Restaurant. Right away, you’ll be able to get a feel for just how close your room is to the unforgettable beach. Even while lounging in one of our pools, you’ll be able to watch the warm ocean water lap onto the white sands of the beach. If you have any questions about where anything is set on our property, please don’t hesitate give us a call. Whether you’re making Victoria House the destination for your dream vacation, or are seeking a stunning location for a honeymoon, we look forward to making your stay with us unforgettable.